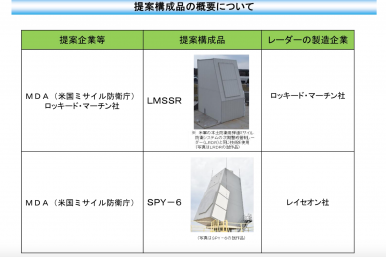 Japan has selected the Lockheed Martin Solid State Radar (SSR) for its two land-based Aegis Ashore ballistic missile defense batteries, the land-based variant of the Aegis combat system for defense against ballistic and cruise missiles, it plans to install in the 2020s, the Japanese Ministry of Defense said in a statement on July 30. “By using this new radar we will increase our ability to cope with missiles on lofted trajectories raising the level of ballistic missile defense,” Japanese Minister of Defense Itsunori Onodera told local media on Monday. The acquisition and installation costs of the SSR systems will be around $2.3 billion, while maintenance and operational costs are estimated at around $4.18 billion over 30 years, according to the MOD. The SSR system is built on the same architecture as Lockheed Martin’s still-in-development Long Range Discrimination Radar (LRDR), designed for the U.S. Ground-Based Midcourse Defense (GMD) system, to defend the U.S. homeland from long-range ballistic missile attacks. “(SSR) is a scalable Gallium Nitride (GaN) based radar building block, which in addition to cutting edge performance provides increased efficiency and reliability,” Lockheed Martin said in a January 2018 statement. The July 30 MoD statement also cited the SSR’s better overall system performance and cheaper acquisition and operating costs in comparison to the SPY-6 radar, which is slated to be installed aboard the U.S. Navy’s latest class of Aegis-equipped guided missile destroyers by 2023. One of the most likely explanations why Japan picked the SSR over SPY-6 is the former’s earlier availability. The SPY-6 will likely not be ready for export before 2024 or 2025. However, Japan wants to deploy both Aegis Ashore batteries by 2023, although the July 30 MoD statement noted that it will take six years from the signing of the contract to the operational deployment of the two batteries, which could mean that the batteries might not be operational until 2024 or 2025 after all. The Aegis Ashore sites will be capable of firing the SM-3 Block IIA interceptors with an estimated maximum operational range of 2,500 km (1,350 miles), as well as the supersonic SM-6 missile interceptor with an approximate range of over 290 km. However, given the higher than expected price tag for the two batteries, the MoD has reportedly postponed the procurement of SM-6 interceptors until the end of the 2020s. For now, the MoD plans to arms each battery with up to 24 SM-3 Block IIAs. The two Aegis Ashore batteries will likely cost around $3.6 billion, double the initial number quoted by the Japanese Ministry of Defense (MoD) earlier this year.